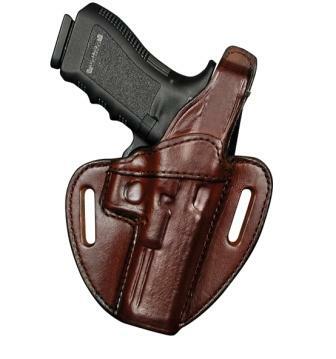 AGENT 711 T.B.-BELT HOLSTER [Agent 711] - $101.60 : Don Hume Leathergoods, Simply the Best! This is a pancake style holster. That provides a comfortable fit due to the unique design that permits the detailed molding to go to the front side keeping the back flat. It is compact and excellent for concealment. With a reinforced overlay at the mouth for a longer life expectancy and easy reholstering. Fits belts up to 1 3/4".